The hectic days of Spring planting and Fall harvest are behind us, but that doesn’t mean we get to hibernate through Winter here at POF. Cold nights mean a wake up call at 3:00a.m. to put more wood in the stove. I’m talking about on nights that are 20 degrees and below. It’s supposed to get down in the teens tonight. We insulated the house very well so it would stay fairly warm if we didn’t stoke the fire but it wouldn’t be that toasty warmth you enjoy waking up to. We do have propane wall heaters as backup if needed. The first chore of the day is usually to scoop out some of the ash from the stove and get the fire going again. In cold weather the stove is your lifeline to cozy comfort. That and a cup of coffee which I didn’t get till much later this morning. No sun today and more light snow means minimal power being absorbed by the solar panels. It is imperative to keep the panels clear of snow even on an overcast day. Although there was no direct sun the panels still absorb whatever light there is during the day. 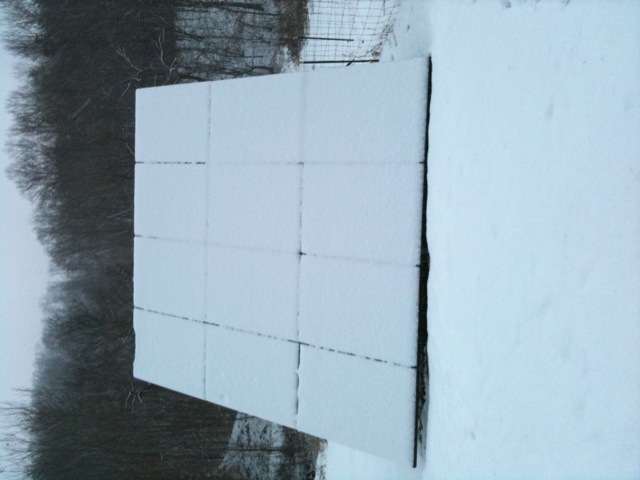 Even the light reflected from the white snow can be utilized as power for the panels. So, second chore of the day….Turn on the generator for a charge and sweep the snow off the panels. Which I did about four times today. Luckily the snow was light and fluffy like packing peanuts. Sonny bought me a long handled squeegee that works great for dragging the snow off. 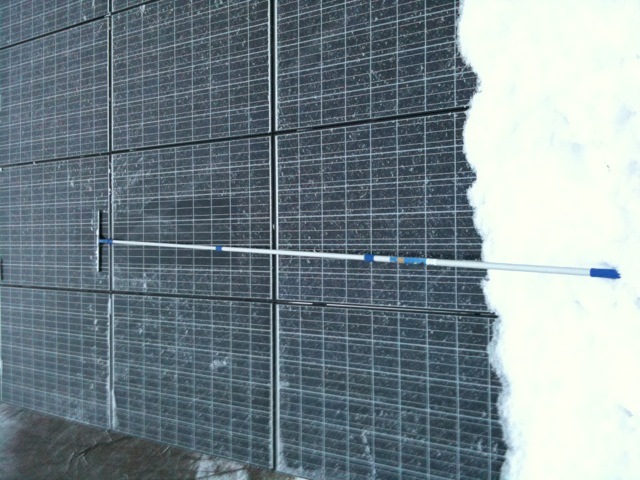 Last year we only had a broom which wasn’t even close to being long enough to reach the top of the PV Array. The right tools make all the difference. Next stop, the chicken coop. I turned on the solar lamps that Sonny installed to give them some artificial light on this grey day. I wasn’t sure if the battery would be charged enough from the solar panels on top of the chicken coop since we haven’t had sunlight for days. A flick of the switch and the coop went from dreary to cheery. I switched out the water container and replaced it with one that wasn’t frozen. I know they have heated waterers but I think they use electric. That would not be an option for us. So my job will be to switch out the water containers frequently throughout the day. Chickens need plenty of water even when temperatures are freezing. I only collected two eggs today, but that is to be expected in this weather. The chickens didn’t want to go out in the snow today and I don’t blame them. I added some more straw on the floor and I think that will give the coop some more warmth. A quick stop by the woodshed to grab a load of wood and finally back inside the house for a cup of joe. With the snow continually coming down this circle was completed numerous times throughout the day. I did get a chance to finish filling out my Christmas cards except for a few of Sonny’s friends of which I can’t find the addresses for. I will have to get them from him later. Even though it was cold out and the snow wasn’t blowing Ruby and I decided to walk the mile down to the mailbox to post the cards. It was actually an enjoyable walk. I made sure I dressed warm in the Carhart coat Sonny bought me, a wool scarf, mittens and my brown plaid Elmer Fudd hat with ear flaps down. Just like the right tools make a job easier the right winter gear will keep you warm. I’m sure I looked very enticing in my ensemble that included L.L. Bean boots and an orange grocery bag left over from Halloween to tote the cards in. It was a colorful accessory that complimented my brown color scheme and it could double as a beacon for hunters not to mistake me for a deer. In my case that would probably be a moose. It looks like the next two days will be the same. More snow, more grey skies and cold. It’s been a busy day and I think I hear the bed calling my name, or could it be that pesky 3a.m. alarm I hear. This entry was posted on Monday, December 6th, 2010 at 8:59 pm and is filed under Battery Bank, Chickens, Farming, Generator, Green, Homesteading, Off-Grid, Self-Sufficiency, Solar, Solar-Powered. You can follow any responses to this entry through the RSS 2.0 feed. You can leave a response, or trackback from your own site. Not a bad downside, I like ice cream. That is a good idea Ron. It might be something we work into our coop. Right now we just have a couple of waters and must bring one inside to thaw out and rotate it with a fresh one. Sounds like a good idea Ron. New ideas that make things easier are always welcome. Thanks Judi. Prayers are always appreciated. Even a little sun would be good xoxo. I’ve read of vaccum cookers which are basically a big thermos that can keep foods hot for a very long time. The idea is to heat your meal to a boil and put it in the cooker so no additional heat is needed. Anyway, I was wondering if you could put boiling water in something like this before bed so you could have a coffee in the morning? Corey, that’s a cool idea, but we have a gas stove not electric. I could have made my coffee on the wood stove as well. I just didn’t take the time to make a pot thinking that it was more important to take care of those chores first. We have two Stanley thermoses that we use on trips one for coffee and a wide mouth one for soup or chili. They keep food hot a long time too. Maybe if I would get up earlier in the morning I could have my cup, but it’s hard for me to get out of bed when it’s dark. Thanks for the idea!